Earlier this week, I received a phone book on my front door step. This was an improvement over my previous experience of receiving an unsolicited phone book as it wasn't wrapped in plastic or buried deep in the snow after being delivered in the middle of the night. I picked up the phone book to prevent a possible tripping hazard for the mail man who may come by later to drop off the mail I might want and may have asked for (i.e. like a card from someone who cares and actually knows I exist). I flipped through the book with the nice little blue"Bell" logo on top with the Yellow Pages logo in the bottom left hand corner. After a quick scan, there really wasn't anything I couldn't find online. In fact, I would argue that Google does a better job in finding local businesses in my area. I normally visit Google Maps, find my address, then search for what I'm looking for. Heck even Prime Minister Stephen Harper do this if he is looking for some "Za". Even better, Google provides user ratings for the listings that are frequently updated. Sadly, my Yellow Pages do not seem to have these updated user reviews on whether Uncle George's Pizza is a rat hole or provides piping hot pizza with delicious one of a kind toppings that you can rave about. All I get with Yellow pages are black fingers, paper cuts and useless raves from restaurant owners about being "the most Italian Restaurant in the Byward Market". I will hand it to Yellowpages and Bell, if you want the residential white pages now, you must request them. Q:Open a phone book to look for a phone number or address? Q: Are you able to sell it? A: No bidders on the last one, not even at $5.00. If something is useful wouldn't someone be able to use it as in "One Man's trash is another man's treasure"? No bidding, not even a contact to see if someone wanted it. Thus, I don't even consider the phone book to be trash, it is lower than that as nobody seems to wish to treasure it. 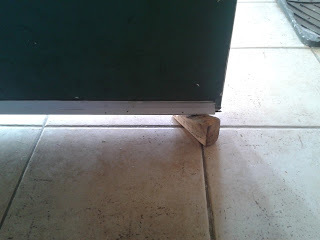 So how to rid myself of this tree killing tripping hazard that I still can't remember the last time I actually used it? Let's go old school with the "Reduce, Reuse, Recycle" to see if we can resolve this problem. "To stop receiving this directory or to request a residential directory ypg.com/delivery or 1 800 268-5637"
At least this time Yellow Pages made it easier to opt out of receiving their yearly printed piece of detritus...or so I thought. I visited the website link provided (www.ypg.com/delivery) to find a pretty simple step by step instructions on how to opt out of receiving the Yellow Pages. The average person would have simply gone through the process and felt satisfied that they have done their part to save the environment, helping Yellow Media Inc. with their debt issues and moving forward the cause that online phone listings are much better. But wait, there is the small print in a size 8 font that the average person would ignore reading "Privacy Statement". My mouse clicking finger got a little antsy. Of course I clicked the link and was taken to another webpage headlined "Privacy Statement" that looked about 3 pages long printed (yes you can print it, this is Yellow Pages after all!). I skimmed through this web page reading about definitions of personal information, collection, what they can use it for and how you authorize Yellow Pages to use it. All very interesting and took about 5 minutes to read and comprehend. "We will generally collect and use personal information to administer our contests, promotions, surveys, reward programs and other services, to understand our customers’ responses, needs and preferences, and to generally manage our business. We may also use personal information to contact our customers or suppliers with marketing or promotional materials regarding our products, programs and services or to assist our front-line staff in providing tailored sales offers to our customers. We may exchange or merge personal information with data obtained from third parties for the same purposes." Bottom line, if you fill in the opt out for your phone book, you will not receive a phone book next year, but you may be harassed with plenty of junk mail and phone calls asking your opinion or attempting to sell you crap you don't need. Yup, YellowPages will sell or give away your personal information to telemarketers without your direct authorization. So personally, I wouldn't fill out that form, a phone book delivered yearly is probably less of a hassle than telling Yellow Pages I don't want one. But still, how do I discard my phone book if YellowPages does not make "Reduce" of the 3 R's that convenient? Let's move on. Some options I found while perusing on the internet seemed interesting possibilities but led nowhere. Q: How about to use a book for another use, like to help others out? A: Nope, the last time I gave a phone book to a granny to boost herself up to drive her car things didn't go so well. I got nailed in the shins with her wooden cane and called some new words that are not listed in the dictionary (but funny enough are all over Twitter). A: Sorry, I got one of those that actually does the job better than a yellow coloured badly processed wood product. Reusing it didn't seem like an option, what to do, what to do? There is still one more "R" to go, hopefully maybe? I guess I could merely toss my phone book in the blue box and let the City of Ottawa take it off my hands. I am paying property taxes for the removal of recyclables and other trash. But this seems hardly fair. Why am I placing the responsibility of the City of Ottawa and their contractors to remove a phone book that could easily not have been left in the first place? Right, because YellowPages' own "Privacy Statement" basically gives you the option to either not receive the phone book and be harassed or just receive the book and be done with it. So I'm left with the queasy option: do I harass the City of Ottawa to remove something because YellowPages wishes to bully their customers into taking the book? or do I find another option? At least "Recycle" does provide me with a viable option and the 3 R's have been exhausted. But it doesn't seem right that the bill for removal of unwanted phone books (like Canada Post and their unwanted junk mail) falls to the property taxpayer to pay. There has to be a better way. So just like in school, let's brainstorm! There should be a "4th R" to the current 3 R's (Reduce, Reuse & Recycle), RETURN! I guess I could travel around Ottawa picking up the unwanted phone books left by the litterbugs hired by Bell and Yellowpages and return it to them. But sadly, the closest Yellowpages Offices there is listed is either in Montreal or Toronto and I don't have the shekels to rent a U-Haul truck and make a delivery like these two did. I also don't want to be accused of creating a "fire hazard" or harm the nearby daycare centre children mentoned by Fiona Story, Yellowpages spokesperson in front of the Montreal office. Another option? 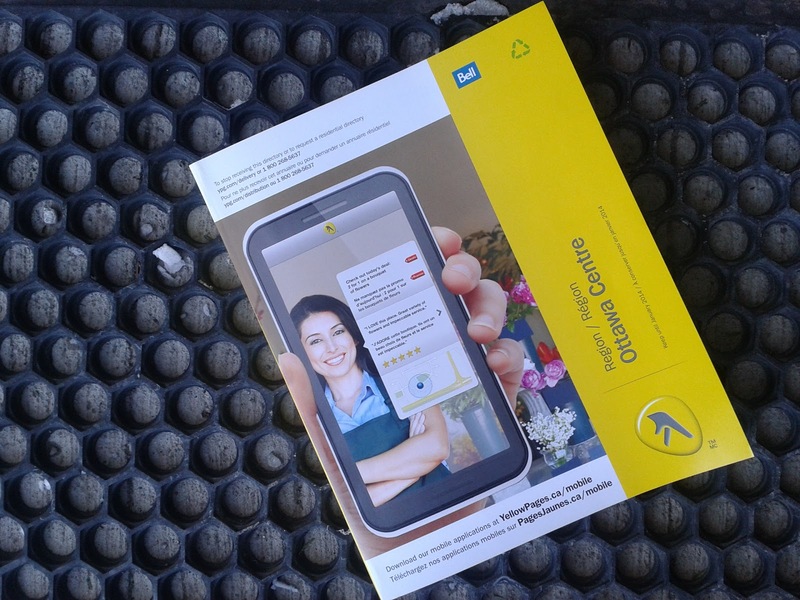 Bell has their logo on the front of the YellowPages copy I did receive. Bell also periodically sends envelopes with my address on it but without my name on it with flyers inside telling me how great their satellite television, internet and cell phone packages are. I've learned to reduce amount of volume in the recylcing box and help Canada Post make money very easily. Anything Bell sends me, I scribble out the address, write "Moved, Return to Sender" and drop it in the nearest Canada Post mailbox for Bell to get back. After all, that does keep their junk mail out of my recycling box, gives Canada Post a reason to keep postal workers employed and increases the amount Bell has to pay in postal charges instead of myself. An option would be to drop the YellowPages book in one of those red Canada Post boxes as Canada Post does love it's flyers and other junk mail. But it seems unfair to the postal worker to handle a heavy phone book that presumably they did not handle or deliver. A quick internet search shows more than 10 Bell stores within 5 Kms of my address. Ironically, one of the top search results is a YellowPages showing me the Bell Store at the Rideau Centre. I do have to pick up an OC Transpo monthly pass for February and am planning a lunch out in the downtown core, I think I will drop off the Bell / YellowPages phone book to the Bell store. I'm sure after that if, as Fiona Story of YellowPages says "1 in 2 Canadians in a month is still using it" then Bell and YellowPages should be easily able to Reuse my copy of the book after all. Or if Fiona Story is incorrect, then at least Bell will be responsible for the bill to recycle this product. The product is recyclable after all by Bell, why else would the blue Bell logo be right next to a green recycling logo. I think I will choose this option, I can drop off my trash (er...detritous) to Bell and pick up my OC Transpo bus pass at the same mall. In the end, it seems YellowPages doesn't make it easy to be green. They litter doorsteps everywhere with unwanted tripping hazards that cause dirty newsprint hands and paper cuts. YellowPages then provides an underhanded option, via their "Privacy Statement", to not have a phonebook delivered to you but to continue to harrass you with unwanted marketing. No wonder Fiona Story's claim that "there is less than 1% opt out" is true, it's because people don't want to be harrassed by YellowPages. Thus, the only option is to anonymously return their books to Bell and YellowPages offices to show them that the following statements by Fiona Story do are incorrect: "Print still answers a need" and "The majority of Canadians use the YellowPages on a monthly basis". Perhaps then YellowPages will get the message that Canadians' do not want phone books on their front porches on a yearly basis.